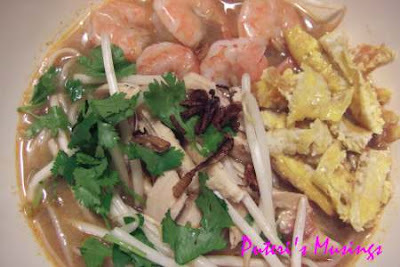 Last week I made Sarawak laksa and as always it is a hit with Doug. Of all the Malaysian dishes that he has tasted, he thinks Sarawak laksa will do well in San Luis Obispo, which is a university town in the central coast of California. I don't know why he would think that, but I guess it is a simple meal, and rich in flavor. The kind of flavor that you can grow to love. The soup base for Sarawak laksa is made from a paste which consists of spices and shrimp paste. I find this particular laksa paste (pic above) the easiest to use. You only need some chicken stock and coconut milk to complete your soup. Salt has already been included in the paste. If you've never tried Sarawak laksa before, make sure you give it a try the next time you visit the state. Sarawak laksa (Malay: Laksa Sarawak) comes from the town of Kuching in the Malaysian state Sarawak, on the island of Borneo. It is actually very different from the curry laksa as the soup contains no curry in its ingredient at all. It has a base of Sambal belacan (shrimp paste), sour tamarind, garlic, galangal, lemon grass and coconut milk, topped with omelette strips, chicken strips, prawns, fresh coriander and optionally lime. Ingredients such as bean sprouts, (sliced) fried tofu or other seafood are not traditional but is sometimes added. This reminds me that I havent cooked lunch. How I wish I have Sarawak Laksa in Pasir Mas so that I dont have to cook lunch today. Can always tell my wife that we are trying Sarawak Laksa today. You do the cooking? Wahh, your wife is so lucky! Next time I go back to Sarawak, I can send you some paste, eh! Easy to make! wah wah..masak laksa :) hehehe..
Pat, giga Liza's perencah laksa, sedap tu. Maya aku nuang kuah ngagai mangkok aku ngena tapis biasa, at least rempah besai tinggal ba penapis. 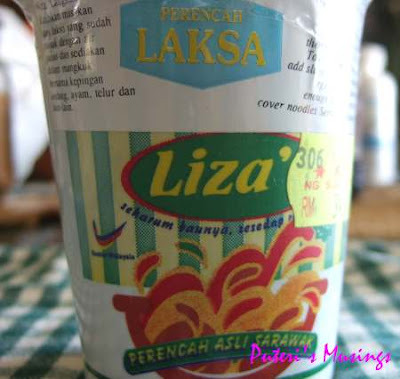 Sedap perencah Liza tu. Laksa Sarawak was selling in maju junction Kuala Lumpur, when the place was just open. A must for me twice a week for lunch then. Maybe the price was too expensive for the budget of customers in maju junction so they have to close. The spices in the ingredient are more elaborate than Laksa Penang with nice aroma. Now, I wonder where to get L Sarawak in KL.